> It's been quite the eventful day for you. Well; two days now. Ever since you bumped into that Louise character, you've stumbled upon another World. Literally, since you went to Makai [Along with Kogasa]. 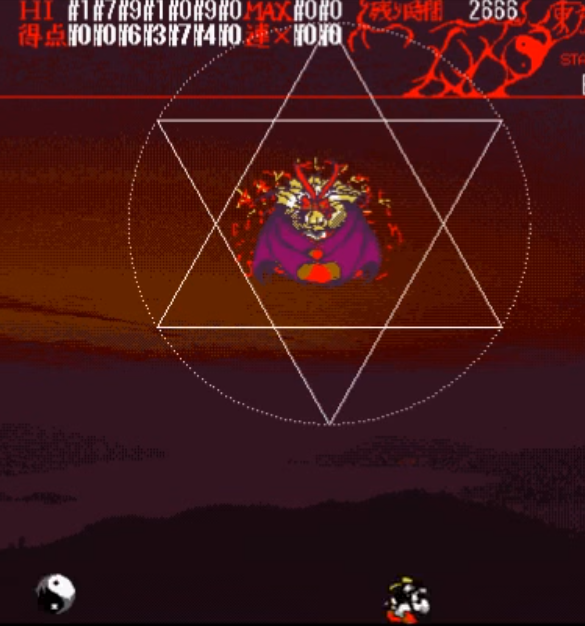 While there, you discovered the cause of the current incident plaugeing Gensokyo, Phantom Daemons crossing over searching for the seal between Makai and Gensokyo; and powerful magical items, most notably the Grimoire of Alice. Specifically, these deamons seem to be a heretic cult who oppose the Goddess of Makai; Shinki. You also got your ability to see in the dark restored by Shinki, and discovered the cruel nature of your ribbon, acting as a seal woven into the fabric of your being in such a way tampering could easily be fatal. However, in crossing into Makai you inadvertently released an evil spirit named Mima, who promptly blew up the Hakurei Shrine. You were also given some candies by Shinki designed to help non-Makaians breathe in Makai. > While in Makai; you saved a deamon who was working for the Heretics from being exterminated by Yumeko for his crimes; named Mayina. He's not very happy about his banishment to Gensokyo. Yumeko has stated he is your responsibility, and should he return to Makai, she will come for you as price of breaking the agreement. > Your return to Gensokyo was stifled by a new barrier, but Okina Matara, a Youkai Sage, created a backdoor into Gensokyo for you, and took interest in your actions. > Back in Gensokyo, upon reuniting with your friends, you discovered, via a commotion at the SDM, that someone had caused Remilia's sister to escape. You found Flandre and played Hide-and-Seek with her Four of a Kind, only to encounter a strange Shrine-Maiden like phantom and a powerful vampire from Makai named Elis, whom Remilia and Sakuya immediately attacked. > The current party is Wriggle; Mystia; Cirno; Daiyousei; Kogasa and Mayina, although all of them are currently incapacitated having been caught in Elis' Illusion. >Don't commit to any plans until there's a general agreement. //Okay we need a plan. //Edit: will be at work until 10 pm MDT. Won't be able to respond to proposals until around 10:30-10:40. Might respond on break if one occurs before then, but only if my response doesn't require a lot of typing. //Why moonlight ray specifically? Aren't there denser patterns to use? //I doubt this would work... Plus Daiyousei and Cirno, being fairies are frail enough to be killed by danmaku. //Additionally Elis might notice this. //If we can do it without Elis noticing, then we should limit it to one ring per person or group of people, or stop doing this after the first ring if it fails. No sense in repeatedly hurting them for no reason, especially if it doesn't work. Also we should avoid hitting Mayina, considering he's weak right now and he won't be of any help to us if he wakes up. //Flatter yes, but maybe we shouldn't go overboard with it? Doing it excessively might be detrimental. >Don't parse anything yet as nothing has been finalized. //Anyway I need to sleep soon, so I'll sleep on the situation and see if I can come up with any eureka moments in the morning. // Ah well this,the resume, confirms that Elis(and Sariel) are indeed "Mostly-Heretics"(the extent of that is depending upon the discovery of relations with Shinki). > Once there is enough that she starts dodging and navigating the fake,activate the " Spellcard Moonlight Ray" aimed and her but after a while arch it upwards above the canopy still seeming to try and aim for Elis. > If it cannot be properly arched up once it start,fire it already arched up to the canopy trying to graze Elis. //I thought we could get Elis away from Alice so we could grab her grimoire ourselves, but that's a gamble because we don't know if we would be able to do anything with it. She might want the Grimoire. She's looking for the seal between Makai and Gensokyo. If "seal" can also mean "barrier" in this case, then we know where it is and that Okina is most likely guarding it somehow. //Sending her at the gate to Makai could also have unpredictable consequences (if she even believes us). Plus it also takes her close to the Hakurei shrine. //As for grabbing the Grimoire, it might draw unnecessary attention to the Grimoire, which could prompt her to just club us on the head and take off with it and/or Alice. //If we stalled until sunrise, and then actually declared a spellcard, we could trap her in the sun with the anti-cheat barrier. But we don't know how the sunlight will affect her, so we can't really rely on this. //Reading Tom's edit, I still say that if we're going to hit friends with danmaku, we should only use one or two rings per person or group of people, as if it doesn't work there's no reason to hurt them any more than we have to. //Also since Elis is looking for a challenge, we should probably specify all our spellcards, fake spellcards, and nonspells, to be their lunatic versions. Although she still had her white top and red pants. Feel like I should put this one to a public opinion seeing as it's my error but it's still a retcon in-quest. //Well we still don't know for sure if she wants the Grimoire (it could be that she's looking for more than one item), just assumptions. > Elis explicitly said finding Alice was the jackpot. //Well, since I can't think of anything better at the moment, I suppose if anything it's a good starting point and it won't be too late to change the strategy if we commit to it. //What do the rest of you think. Should we go ahead with this...? I'll withhold my agreement on these actions for now due to my concerns. //I mean it's your quest. Do what you want to do lol. //EDIT: Whoops, didn't notice the last line there... I mean if it was retconned it would make a potential last resort strategy easier, but otherwise I'm still neutral on the matter. What does everyone else think? // I'm not that cruel of a GM. Even if you manage to take a really bad/foolish course of action that leads to a bad end I'll revert you to the last major checkpoint [AKA: The start of the Elis encounter]. // Bad Ends are entirely possible mainly because I don't think I should simply over-rule bad choices, but at least RP out the result before using Bites the Dust, sorry it's Friday I'm gonna watch Jojo soon I'm in Jojo mode resetting time. // This also lets me put intentionally challengeing situations before you guys without the risk of, you know, Game Over for good. // I agree to go ahead with Tom's grouped commands , although it would be better to hold on hitting our group ,and by Lunatic-caliber at that, with danmaku since it is stated that the spell's effect would leave once Elis is out of range(uncertain measurements) ;perhaps apart from that if a focused "Demarkation" keep away the red light's range but this is not the time and place to find out. //Do spellcards only dispel danmaku (if at all) or does it also work on other kinds of magic? Is there a difference between bombs and spellcards besides bombs not putting you in a trance? >Do spellcards only dispel danmaku (if at all) or does it also work on other kinds of magic? Is there a difference between bombs and spellcards besides bombs not putting you in a trance?Have we tried it out,or noticed elsewhere, in that regard with "Heavy Danmaku" or even Lethal? > When there is a sure opening for speaking and being on guard: " Oh what become of your previous meet-up with my "friends",Remi,Flan ,Sakuya and Koa",the first 2 are vampires as well :perhaps you ended up using this move with them as well or...?" >Does it also work on other kinds of magic? >What are the differences between bombs and spellcards? //Branneg beat me to it. //We probably shouldn't say anything now since Elis is losing her patience. //Running an errand. Will be gone for 30-90 minutes. > If the moment,and if not delay it when there is one, is a opening for speaking and with the guard up: " Oh what become of your previous meet-up with my "friends",Remi,Flan ,Sakuya and Koa",the first 2 are vampires as well :perhaps you ended up using this move with them as well or...?" > The declaration [Or break] of a spellcard acts like a bomb in that it clears danmaku. It probobly dosen't do that against non-danmaku. You don't know. > A bomb is essenssially the use of a spellcard when it's not your turn. You usually have to designate a spellcard *as* a Bomb [You haven't] to be able to use them. When used in this manner, the spell has a very short duration, maybe 2~3 seconds. > Noted for when an opportunity arises. Elis is fine with talking while fighting as she has done this previously. // Danmaku is specifically non-leathal. The real thing is simply magic. // You don't know how Elis would react to this. // Also general note; Danmaku dosen't do friendly fire [Otherwise the Primsrivers or Three Fairies would be screwed]. Real attacks do. >Only do this when we're not faking a trance. We need to keep the act up, after all. //Other than that, I'm fine with everything else. > You fake declare Moonlight Ray. The Vampire weaves through your attacks without hardly moving, looking upset. > "Is this all you have? The bird was more entertaining..." she says in a manner that betrays boredom. "You did that thing differently to the pink-haired bird too..."
> You 'end' the fake spell. > "Is the warmup over?" she yawns. "Please, skip with that stuff. Those guys back there were enough of one." > "The Vampire and the Maid?" Elis asks. "Oh... well... they've seen better days. I'll admit, they made me take them seriously."